Cecile Saidi with the excited St Columba students. I feel we can achieve something beautiful if we work together. 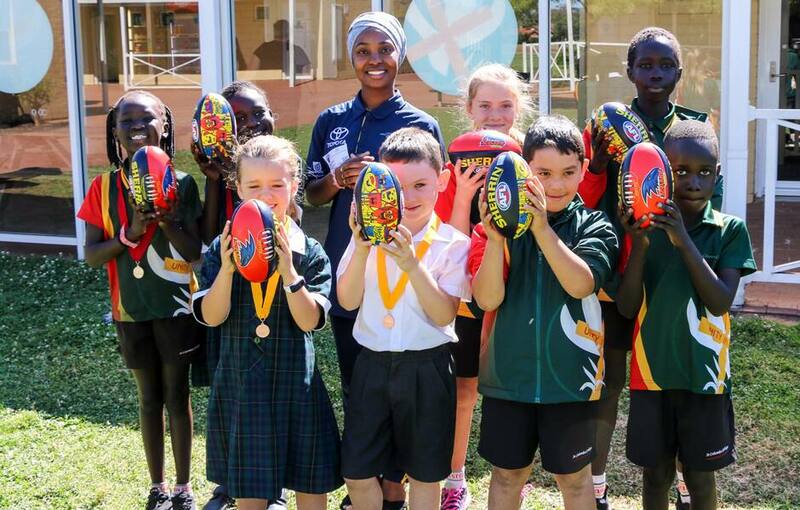 Young students at St. Columba College have received 50 footballs from the Adelaide Football Club to play with as part of their multicultural program. On Friday, November 16, Adelaide’s Multicultural Liaison Officer Cecile Saidi went to a school assembly and handed the balls over to the excited children. In celebration of diversity and multiculturalism, one student from each of the 23 classes was invited on stage to receive the balls as a reward for showing kindness in their daily actions and working harmoniously with others. Saidi said it was a great pleasure to give out a ball to each of these students. “Their faces lit up at the mention of the Crows and footballs,” Saidi said. “I look forward to further collaboration with both Anglicare SA and the St. Columba College, in introducing the multicultural communities to footy and giving the students a fun experience of the sport. St Columba’s Assistant Head of Junior School Mathew McGinty said the children were ecstatic to have received the balls. “Many of the children were proudly clutching the footballs as they walked out the gates,” McGinty said. Earlier this year, the Crows gave Anglicare SA, a service provider for Culturally and Linguistically Diverse communities, 100 balls to give out to people in need. Fifty of the balls have already been given to Anglicare SA’s new arrivals program before 50 were handed over to St. Columba.